Since the launch of the Link Builders Toolkit back in April of this year, I have received a ton of positive feedback on the product. I also received some awesome suggestions on how I could improve it. So I took all of that feedback and have updated the toolkit to provide the additional data and features you requested. 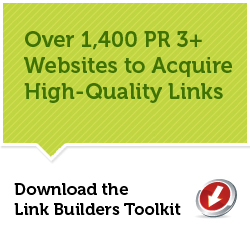 The Link Builders Toolkit is the ultimate resource and collection of over 1400 websites to gain high-quality inbound links from. Each site has been hand-picked to find only the websites that are at least a PR 3 or higher. 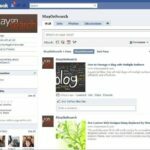 They are also organized by category so you can easily find the right type of sites, depending on the type of link building you are doing. This excel document saves hours and hours of manually trying to find places to acquire links from. This toolkit is perfect for Link Builders, SEO’s, Internet Marketers, and In-house Marketing teams! In the new Link Builders Toolkit v 2.0, we have added a number of new features and improved, based off of your feedback. 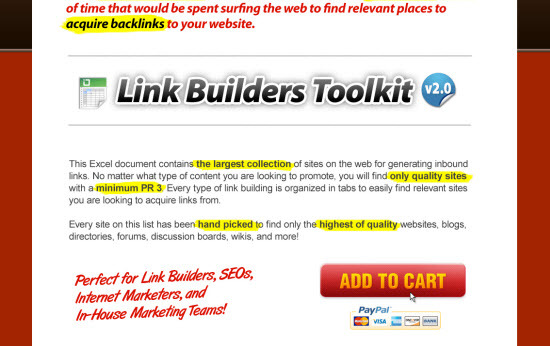 The new landing page is now on LinkBuildersToolkit.com, which has a much more appealing and user-friend design. If you sign-up to become or already are a StayOnSearch RSS subscriber you can unlock a special discount on the Link Builders Toolkit. All you have to do is become a RSS subscriber and look in the footer of the RSS feed for the link that will give you $13 OFF the toolkit!